Yeah, I know I haven’t been blogging much, and I should post something about the Astro City movie deal. But I’m still recovering from San Diego. What a fun—but exhausting—convention! 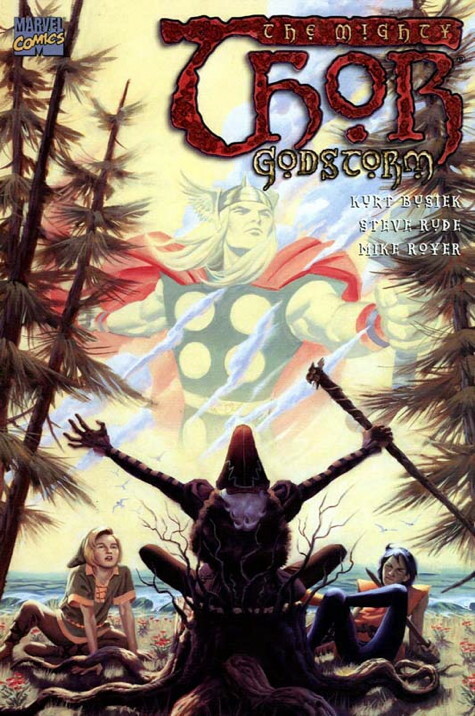 In the meantime, since Tom Brevoort just told me, I’ll tell you: Next February, Marvel will collect Thor: Godstorm, the mini-series I did with Steve Rude and Mike Royer, in a spiffy hardcover! I’m very pleased—I’m proud of the book, it looks gorgeous, and it was well-received. It’ll be nice to have it on the shelf. So thank you, Kenneth Branagh and Marvel Studios, for creating a situation in which more Thor collections in bookstores sounded like a good idea! It’s a series of interlinked stories—one from the era of myth, one from Thor’s early days with the Avengers and one from then-current “Jake Olson” era—as an ancient mythic threat rears its head in multiple forms, goaded on by the machinations of Loki (who else?). Steve Rude set out to channel the spirit of Kirby, and did so really well. Tom tells me the story will be backed up with a 10-page “Tales of Asgard” story by Tom deFalco and Mike Mignola. So it ought to be a nice package. As is often the case with me, I saw his call for entries on Friday, thought, “Hey, that looks interesting,” and then my brain didn’t kick into gear until well after the deadline (something all my editors can attest to, badump-bump! ), but I realized this morning that I had some unusual choices, because where my mind went to on this wasn’t simply comics I like and want more of, but particular creative visions, writers and artists who say what they say distinctively and memorably, but more, they say it in a way that makes me want the results serialized. Where there are lots of comics and lots of comics creators where I want the results in nice book collections on my bookshelf, these are the ones where I want that 20-pages-or-so every month (or whenever), to have that particular joy of reading a chapter, a short story, whatever, and knowing the next part will be along soon, and that joy will be repeated and extended and deepened. These are the comics I want to find a new instalment of on the spinner rack, when I bust into the eternal Colonial Pharmacy of my mind, transplanted from the corner of Mass. Ave and Waltham Street in Lexington and taking up permanent residence in my memories. I’m not limiting myself to five choices, because having missed Tom’s deadline, I scoff at his rules. Ha! 3. THOR by Walt Simonson. Doesn’t even have to be Marvel’s Thor, and might even be better if it wasn’t. 4. KAMANDI by Jack Kirby. This means we need an immortal Jack Kirby, but I ask you, is that such a bad thing? 5. TYRANT by Steve Bissette. 6. FABLES by Bill Willingham, Mark Buckingham and Steve Leialoha. 15. LEAVE IT TO CHANCE by James Robinson and Paul Smith. Okay, that’s what’s regularly on my imaginary newsstand. I’m sure there’s plenty I’m not thinking of, and there’s stuff that might be on the list soon, like Bunn & Hurtt’s THE SIXTH GUN. And there’s stuff I could just make up, like an ongoing magical-intrigue series set in San Francisco, by Chris Claremont & Graham Nolan or an ongoing TOPPER series by Roger Stern and Bob Oksner. But I’d be pretty happy with this. So, what’s on your spinner rack? 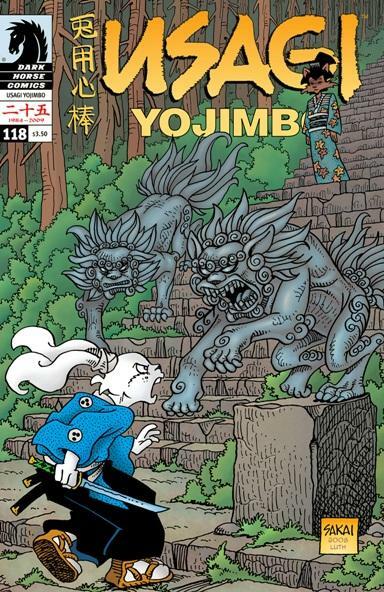 Posted in Uncategorized	| Tagged amy unbounded, bravo for adventure, criminal, fables, hollywood superstars, kamandi, leave it to chance, savage dragon, section zero, she's josie, stig's inferno, thor, tyrant, usagi yojimbo, zot!